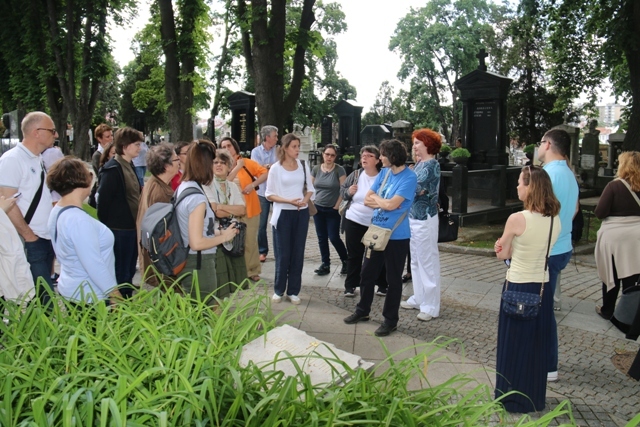 Each May, the New Cemetery in Belgrade traditionally takes part in the Belgrade International Architecture Week (BINA). The 12th edition of BINA is held from 27 April until 25 May 2017 under the slogan Ideas Yards. 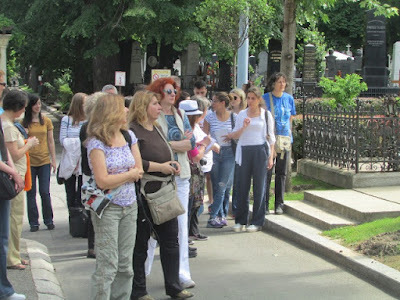 In order to share memories on fascinating figures, present captivating monuments and promote cemetery as a generator of knowledge, the New Cemetery in Belgrade participated in this year's BINA with guided thematic walk titled Along the Alleys of the New Cemetery organized on 14 May and guided by Dr. Violeta Obrenovic, our knowledgeable employee and the great connoisseur of sepulchral culture and funerary art. The walk started at the entrance of the New Cemetery and included a tour of the main alleys, with emphasis on individual sculptural works and graves of distinguished individuals. Particular attention was set to the following spatial units: Arcades, Alley of the Greats, Alley of Distinguished Citizens, Alley of Executed Patriots, as well as the architecture and history of the Church of St. Nicholas, the Chapel of Field Marshal Radomir Putnik, Charnel-house of Defenders of Belgrade 1914-1918, Russian Charnel-house and the Iver Chapel. 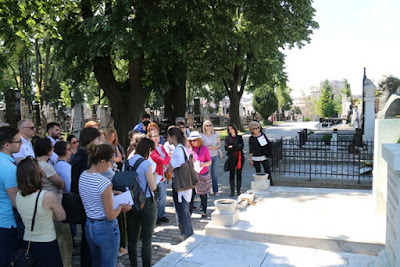 This guided free walk along the main alleys of the New Cemetery in Belgrade has aroused the high interest among the public and once again the number of interested visitors far exceeded the optimal number of places set for the guided tour since the group was fully booked in record time. With so many fantastic stories the attention of visitors was the uppermost attracted by anecdotes both about the lives of the prominent figures, as well as about the ordinary people with their extraordinary destinies, unusual habits, and unique characters that with that keen sense for all those charismatic biographies our talented art historian tirelessly year after year shares with eager public. 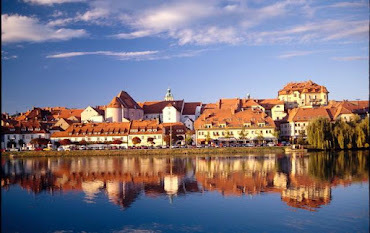 The planned two-hour walk was as we predicted extended and almost doubled, much to the satisfaction of all the visitors. Do not miss the opportunities to visit the New Cemetery in Belgrade for we have prepared a lot of exciting cultural events in May and June.